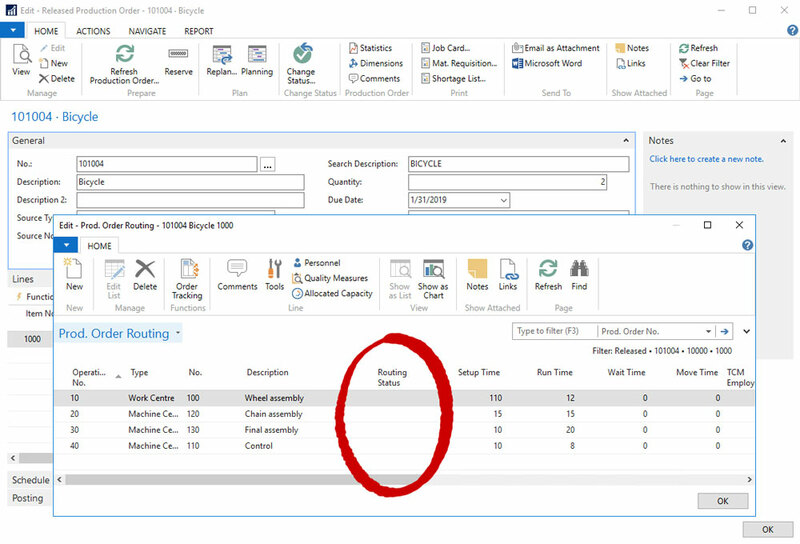 Shop Floor Insight can automatically change the status of a routing step to “In Progress” when a machine operator starts recording time against a production order. Let’s see this in action. We’ll start with a released production order. On the shop floor we’ll scan our badge to login, and then scan our barcode for that production order routing and operation combination. As soon as we start recording time the production order routing step automatically changes to “In Progress”. Shop Floor Insight can also indicate this updated status to shop floor users, showing both the routing status with the “Routing Status” column visible, and whether or not it’s “Active”, where Active indicates if anybody has any open time card lines that people have clocked-on but not yet clocked-off. To move the routing status of a step to “Finished” there are a few different options, depending on what best suits your facility. The easiest is the ability to automatically set the routing status to”Finished” when finished goods are output on that routing step. 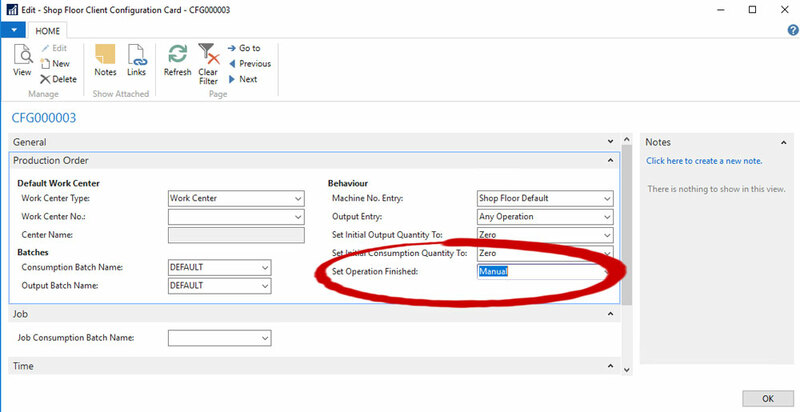 To configure an automatic routing step change to “Finished” when output is performed, navigate to Shop Floor Setup. 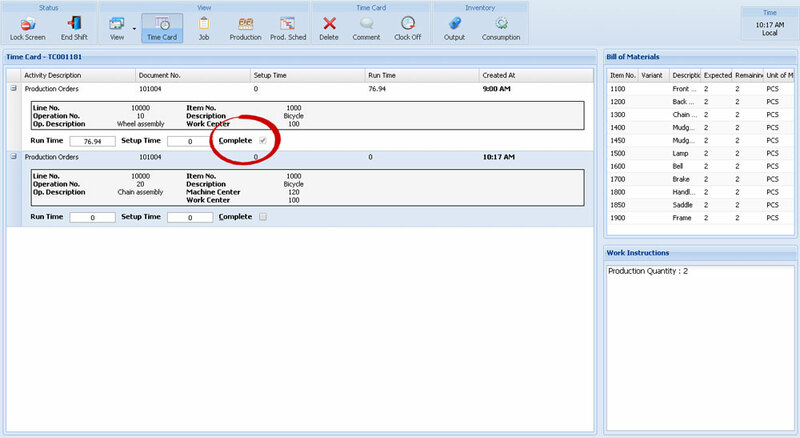 Look for the “Auto-Finish Operations” field in the “Production” section in the “General” fast tab. Set this to any of “On Any Entry”, “On Partial Qty.”, or “On Full Qty.”. We’re going to use “On Any Entry” for this example. We’re also going to allow output on any operation to allow us to output on each routing step on the shop floor. 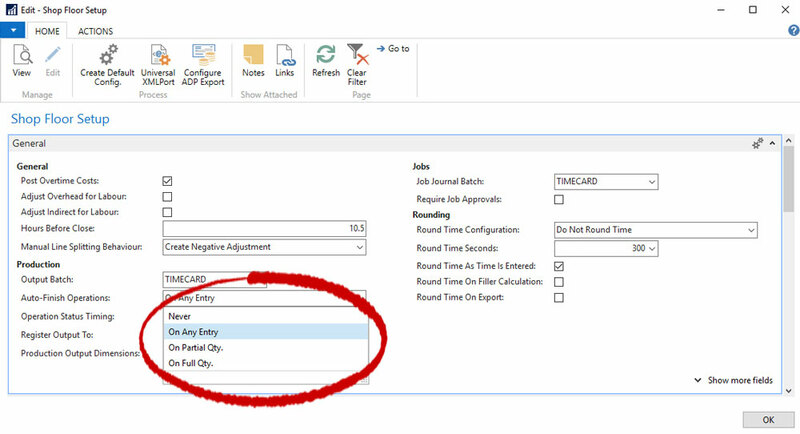 To do this, navigate to the appropriate Shop Floor Client Configuration for the scanning station and change “Output Entry” to “Any Operation”. After changing these settings we’ll then output on that step. 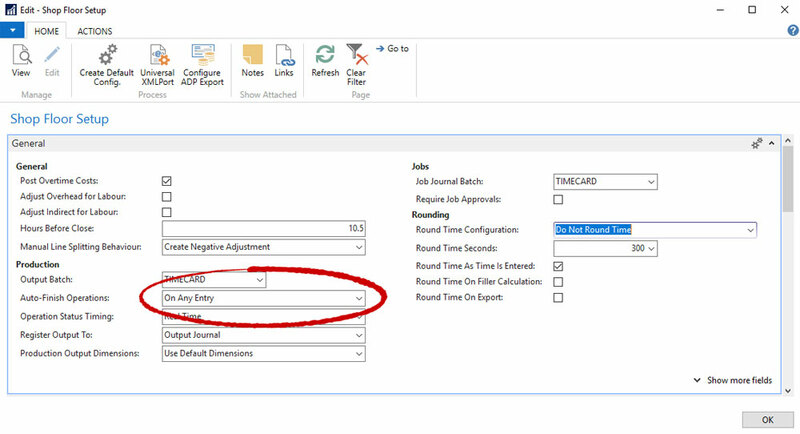 At this point the output entry will still be set to “In Progress”, however an output entry will be waiting for a supervisor to review and post in NAV, where it will automatically have the “Finished” flag set. When the supervisor posts the output recorded from the shop floor we then see that the routing step was automatically changed to “Finished”. Another option is to allow setting the operation to be complete while time is being tracked. This approach provides the ability to instantly set the routing status to finished. 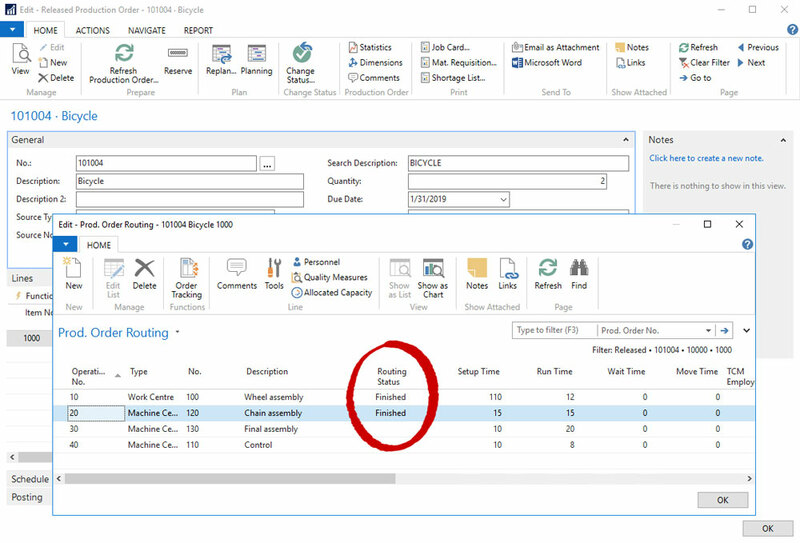 It’s important to remember that Dynamics NAV does not allow changing a routing step status away from “Finished” back to in-progress, and Shop Floor Insight does not provide an ability to over-ride that restriction. 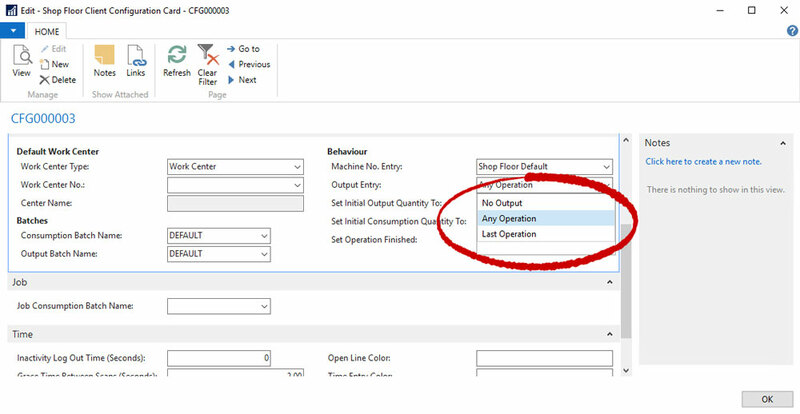 If setting an operation to finished manually works for you then navigate to the Shop Floor Insight client configuration and change “Set Operation Finished” in the “Behavior” section of the “Production Order” fast tab to “Manual”. 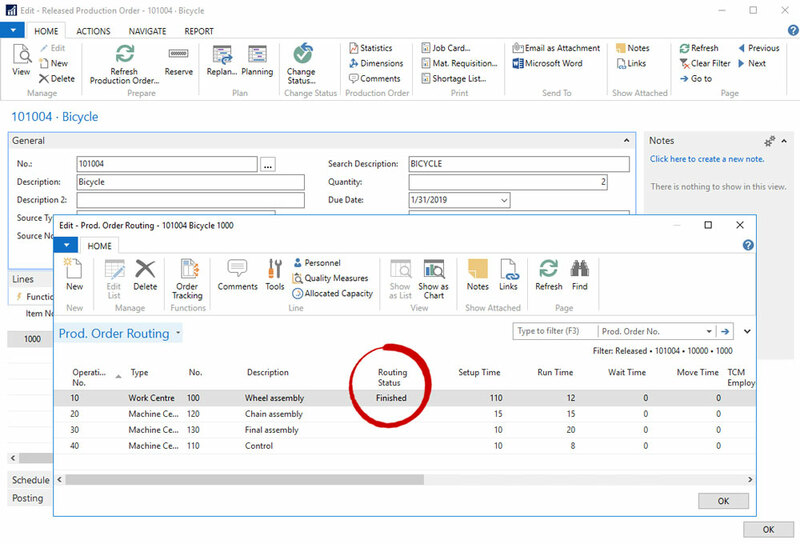 This setting will enable a checkbox titled “Complete” on the shop floor. Which, when checked immediately sets the routing step status to finished. 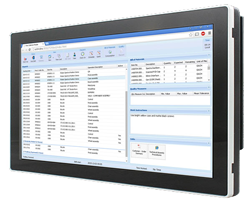 Setting the routing step status automatically with manual output is useful for providing real-time tracking of production order completion. When combined with NAV’s Flushing Method configuration then it can help trigger NAV’s ability to forward or backward flush for automatic relief of material used in your production order. 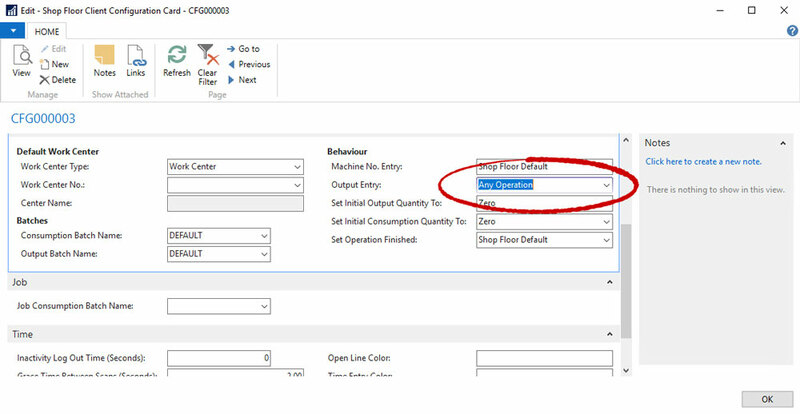 If the production order is configured for forward flushing and has an appropriate routing link code setup, then you can combine the automatic setting of Routing Status to ‘In Progress’ so that consumption will occur when an operator clocks onto that routing step. With backwards flushing configured then material consumption can occur automatically when the output journal is posted after shop floor has flagged the line as finished. It’s important to remember that a combination of automatic routing step changes triggering either forward or backward flushing can change the need for a NAV license from a limited user to a full user.